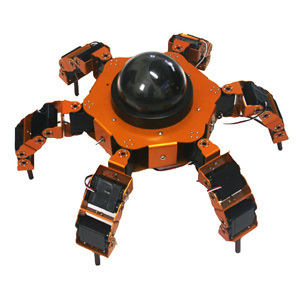 This robot is a very unique hexapod walker. The three DOF (Degrees of freedom) leg design provides the flexibility required to walk in any direction! The robot uses 18 robot servos for the legs. This kit includes everything you need to make a functional robot except batteries. Includes CDROM with manuals, schematics and example software. Controlled by Atmel AVR (ATmega128), the parallel port download programming cable is included.